I’m bing-watching this Cinemax series, directed by Stephen Soderbergh, on HBO2 today. Of course, the main draw is Brit Clive Owen, who sports a thin mustache on the show. It’s SIMPLY riveting, even if you’re a bit squeamish re: blood (like me)! The setting is early 1900s- an important era for medical innovation. I recommend it to those who are looking for a shot (forgive the pun) of realism in their medical dramas. ALL the actors are good- many of whom I’ve never seen before! 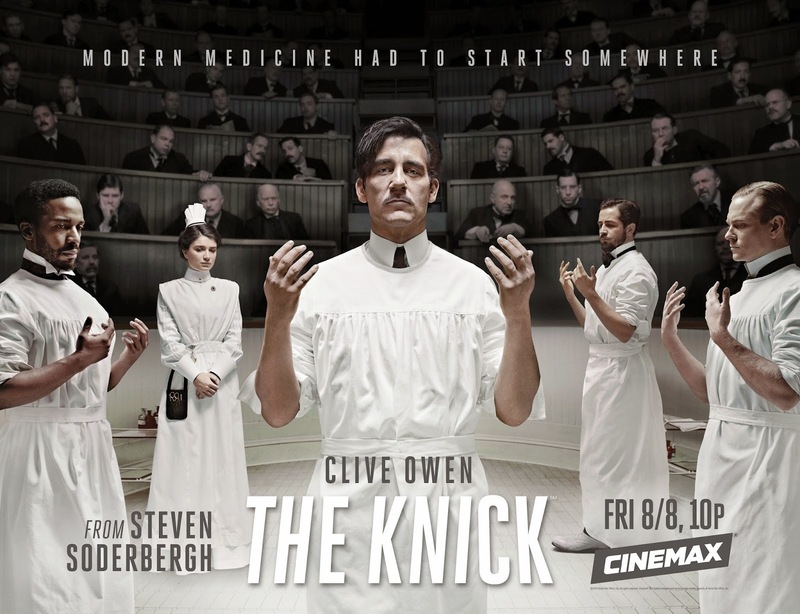 In the series premiere, the head of surgery (at The Knickerbocker, a public hospital in NYC that serves mostly poor, working-class patients) shoots himself after many failed operations on pregnant women w/ complications. The man working directly under him, Dr. John Thackery (Owen), gives an eulogy for Dr. Jules Christiansen (Matt Frewer, nearly unrecognizable w/ long fluffy beard/shaved head) in a Catholic church, then is quickly promoted to his old friend’s post. We can tell from his tone/words to the nun after the funeral that Dr. T doesn’t put much stock in religion. So, who will be the new Assistant Chief of Surgery? Dr. T, who is brilliant/arrogant/confident, wants it to be the young Dr. Everett Gallenger, who has been working under him for some time. The wealthy lady whose father currently finances The Knick, Miss Cornelia Robertson, puts forward her choice- Dr. Algernon Edwards. He studied at Harvard, then worked in London, Paris, etc. Dr. T is quite pissed off about this, even threatening to quit. Dr. Edwards (Andre Holland- a theater actor who recently played Andrew Young in Selma), to almost everyone’s shock, is a black man (whoa)! Dr. T thinks this is the last straw- he’ll only be a distraction, making the important work of the hospital even more difficult. But he has to give way or the electricity won’t be put in. We also learn that Dr. T is a habitual cocaine user (whoa again)! A young nurse, Elkins, recently arrived from West Virginia has to help him out by injecting him in his house (just before a crucial surgery). NOTES: This show is based on the life of a real, pioneering, yet quite flawed surgeon (not unlike the lead character). Yes, cocaine was used (in small quantities) in the early days of surgery, as we see here. Doctors created their own tools, like the metal tubing we see inserted inside patient’s stomach. Dr. T sits her down and calmly explains to Elkins that he has things (his drug use) under control. He thinks she had been avoiding him; she says not at all. The lives they have inside the hospital are different from the lives they lead outside, he says. Dr. Edwards is in some dark, cluttered basement room (his office). He barely gets to do any work, though he expected this type of treatment. Dr. E searches for the black woman who had a swollen arm, then drains the liquid from her arm. She wonders about his work. Later, we see that he can fight (boxing) when attacked by a young/angry/jealous black man. NOTE: Tenderloin District, where Dr. E lives, was considered to be a notorious/red light area of NYC; in modern times, it has some of the most expensive real estate in Manhattan. Wow, how times change! Dr. E has a secret side clinic going on the late night hours! We learn that he is providing a much-needed service to the black population of the area. He sees the careful stitching of a seamstress- she can work alongside him as a nurse. We also learn that Dr. E’s mom is the long-time/beloved cook of the Robertson family! Dr. T wants to have cadavers to practice on, but only has access to dead pigs. The manager complained that The Knick is competing w/ Cornell, Columbia, and NYU. Everyone is worried re: (the rapidly spreading) typhoid fever. Rumor has it that the new immigrants carry it (yeah, blame ALL the worst stuff on poor immigrants). Dr. T sets that right- it’s not just a disease of one’s lifestyle. Elkins assists Dr. T during the reconstructive surgery on his old girlfriend Abby’s nose. She starts commenting on the “proper lady”- he shuts her up w/ one of his quick cutdowns. Dr. E loses a patient- perhaps for the first time. Later on, he takes out his aggression on a man who challenges him to fight. The ep opens w/ drunken/rowdy mean stomping on rats for enjoyment. Ugh, that just looks terrible! (Hey, history was NOT all pretty.) Then, another OMG scene- a grieving widow gets pig remains instead of her husband’s body! His cadaver will be used for practice/ experiments (of course). Dr. E freezes during a surgery, but Dr. T yanks him out of it w/ an insult. Drs. G and E almost get into a fight (whoa); the doctors observing break into a laugh afterwards. The self-important/burly health inspector (who we met in E1) is back. He goes to a wealthy family’s home (w/ Miss R as a sort of liaison) whose patriarch recently died. He asks about the dead man’s “character,” staff, and then moves on to “toilet rituals.” LOL! Later, Abby (who is all bandaged up, but recovering) says “I should have chosen you.” He disagrees about that- she chose the wrong husband, but HE wouldn’t have suited either. Elkins stands outside the door and listens in on their private convo. Hmmm… I definitely think she is intrigued by Dr. T! Cleary, the bearded/big ambulance driver blackmails the nun (Harriet). He somehow found out that she performs abortions on the side (illegal at that time, of course). He wants a cut of her profits. Elkins follows Dr. T to his usual opium den in Chinatown. She sees him lying on the arms of a young Chinese woman- both are passed out. She quickly rushes away. Cleary rushes to get a young woman to The Knick. Dr. T says that she tried to end her own pregnancy (yikes)! Unfortunately, she dies on the operating table. Bertie’s father watches this all, then comments to his son: “There is only poverty in poverty and struggle in struggle!” He says he climbed out of a place worse than this hospital, and is clearly disappointed that his son works there (thinking it “romantic”). The younger Dr. Chickering says that he wants to learn from Dr. T.
OMG, an old/drunken barber sends a guy off in a cart after he can’t treat him! Dr. E has a Cuban patient w/ a hernia, but (at first) explains it using “big words” that confuse the man. Dr. E says he can perform surgery using a wire- the man (a cigar roller) agrees. Dr. T is surprised when a noted gangster (owner of “cathouses”), Mr. Collier, is brought in by the manager for a rush surgery. In the operating room, two other gangsters sit and wait, guns in their belts. We know this manager likes to gamble and spends time w/ young prostitute. We see the head housekeeper and some staff of that big/fancy house where the health inspector and Miss R are visiting. They are so well off that they eat ice cream each day. Hmmm… is this making them sick? Dr. T tries to get the board to see the importance of an x-ray machine. Some of the men say they should move The Knick to a new location to be near the donors. Miss R says that “almost every other hospital has moved uptown,” so the poor need The Knick even more. Mr. Barrow (the manager) tells his favorite pro that he stole money from his employer. A cop later approaches him about getting an introduction to Collier; he has a business idea. Cops bring in “a lot of girls who hook for no one,” so he can bring some in to be under Collier’s “protection in a nice place.” He has a lot of mouths to feed. (Yes, everyone is out for something! Cleary argues w/ a husband re: his wife’s (possible) abortion. They argue re: religion and sin for a bit. Later, Harriet explains that “the child was too far along- 7 months.” It’d have “been a sin” to abort this baby. Oh no, Dr. G’s baby girl may have meningitis! She won’t stop crying since breakfast, his wife says. They quickly head out for a hospital. While Dr. E and a group of ladies are performing hernia surgery (using silver wire), a nurse and her beau pass through their room, so they shut off the light. They wanted to hook up- notice the mention of “French letters.” After they leave, it’s lights on and back to work. LOL! Hmmm… something happened to Capt. Robertson in Nicaragua; Dr. T helped him out. When Dr. T comments that his daughter could be running The Knick in 10 years, the financier laughs and replies that he’s expecting “a gaggle of grandchildren.” Dr. T wonders if Cornelia knows this (hehe, he gets her).